Recently the Colombian government announced that the country would cease the use of aerial spray techniques in its anti-narcotics program. Aerial spraying has been used to control illegal coca crops, which provide drug cartels with the raw material needed for cocaine production. The decision came only days after the World Health Organization stated that the primary ingredient in these sprays, glyphosate, is "probably carcinogenic". Following Bogotá's statement, several alternative methods of fighting illegal coca production have been suggested. 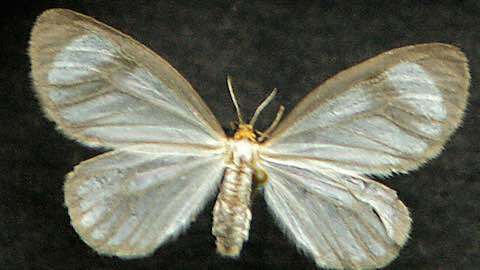 One of the more bizarre proposals suggests mobilizing the Eloria Noyesi moth, commonly known as the Tussock Moth, as a form of bio-control. A number of prominent Colombian lepidopterists support this proposal as a safe and cost-efficient alternative in combatting illegal coca production. The use of the Eloria Noyesi for anti-narcotic operations appears plausible because its caterpillars feast on coca plants. This proposed anti-narcotic methor calls for lab breeding of the moths, under controlled conditions, which would then be released into areas where illegal coca production has been suspected. Colombian botanist, Alberto Gómez, has been one of the primary proponents of this alternative proposal. Gómez explains how the, "Eloria Noyesi only lays its eggs on coca plants" and that the caterpillars then consume 1.5 times their body weight each day in coca leaves. Furthermore, Gómez believes that this species solely consumes coca plants. In a small-scale laboratory test he observed, "If you close this moth in a jar with a banana leaf, it dies of hunger before eating it". These facts provide a baseline of evidence to prove the potential of this alternative technique. Gonzalo Andrade, a biology professor and butterfly researcher at Bogotá's National University, also believes that the government should seriously consider the use of the Eloria Noyesi as a less harmful form of fighting illegal coca production. Additionally, it is interesting to note that Alberto Gómez previously proposed this method in 2006 to Juan Manuel Santos, when the latter was Minister of Defense. According to Gómez, Santos thought that his proposal "was an interesting idea;" however, the proposal did not receive funding from Colombia's anti-narcotics program. The insatiable appetite that the Eloria Noyesi caterpillars have for coca plants is well-documented in Colombia society. In fact, the species' nickname, el gringo, is based on its dependency on the coca plant. This connection is based on the fact that "gringo" means foreigner in Spanish and, stereotypically, foreigners have been the largest consumers of cocaine. There have been multiple instances recorded where the Eloria Noyesi species decimated coca production. Alberto Gómez says he "got the idea of using the moth for coca eradication in 1982, when news emerged that a plague of ‘gringo' moths had devastated coca fields in Colombia's Putumayo province". Additionally, Fernando Araújo Vélez highlights an instance in Bolivia in which Eloria Noyesi was responsible for the elimination of coca crops adjacent to the River Igaparaná in Bolivia in the early 80s". The last documented instance of Eloria Noyesi affecting coca crops occurred in Peru and caused significant financial damages in that country. A book published by the Office of Technology Assessment of the U.S. Congress titled Alternative Coca Reduction Strategies in the Andean Region highlights this Peruvian occurrence. The text states, "Eloria Noyesi was reported to ‘swarm' and destroy almost 20,000 hectares of coca in Peru, causing losses to drug traffickers estimated to be at least $37 million [USD]". Furthermore, the book argues how many coca producers have to resort to insecticides in order to stop Eloria Noyesi from damaging their crops. These three historical instances of Eloria Noyesi affecting coca production provide the argument of Gómez and Andrade with a historical support. The fact that this species has successfully ruined coca production and affects the thinking of coca growers speaks to the threat that it poses. While some people may think that this idea "seems like it came from a chapter of the Simpsons"; it is important to consider that "the use of animals to control plagues is not unreasonable and is called biocontrol". According to Anthony Shelton, an entomologist at Cornell University, "There are many successful cases of biocontrol… it is a more permanent solution to the problem". He cites cases in the United States, Australia, and Chile to prove his point that biocontrol, generally speaking, can be an effective method. Another piece of evidence that supports the implementation is the fact that this species is native to Colombia. Gonzalo Andrade has stated, "We would not be causing any impact because the moth is naturally distributed over a wide range in Colombia. If it was not like that, I would be the first to say ‘I do not support this'". This piece of evidence is crucial in the arguments of the proponents of this method. After all, life span of the moth does not exceed 30 days, and for this reason, overpopulation is hardly of concern. Alberto Gómez has even provided a plan for a program that would rely on rural farmers, perhaps providing them with additional revenue. Gómez proposes, "Farmers could be taught how to breed the butterflies. In Costa Rica successful trials with farmers cultivating butterflies for exportation have occurred and here we could do the same with the butterfly that eats coca". Implementation of a program such as this could be challenging; however, it could provide additional economic infrastructures in usually isolated rural areas. The primary concern regarding the plausibility of this anti-narcotic alternative is the potential for environmental degradation. If these moths consume plants other than those that produce coca, their large-scale release into the wild could have severe ramifications on those ecosystems. Further research needs to be conducted before policy makers decide on the issue. Gonzalo Andrade, for example, is concerned that the moth may harm the other species of coca plants that have traditional uses. He hopes that further research will be conducted to solidify the notion that the Eloria Noyesi only consumes the two species coca plants that can be utilized for cocaine production. Professor Shelton, whose concern is based on protecting the other plant species, shares the sentiment that more research be conducted prior to implementation. The need for further research is currently the only roadblock that stands between this alternative method and implementation. The release of Eloria Noyesi to fight illegal coca production has quickly gathered attention in Colombia. Aware of the potential ecological pitfalls of this plan, "Colombian officials promise to do their due diligence" before implementing this program. Scientists plan on studying whether or not the Eloria Noyesi will consume other plant species by placing them in environments with only that food source in their laboratories. Once this is known, government officials will then consider the implementation of releasing the Eloria Noyesi species into potential hotspots of illegal cocaine production. ""La gringa" era …a responsable de la eliminación de los cultivos de coca adyacentes al río Igaparaná, Bolivia, a comienzos de los 80"
"parece sacada de un capítulo de los Simpson, pero usar animales para controlar plagas no es nada descabellado y se llama biocontrol." “Hay muchísimos casos exitosos de control biológico… es una solución mucho más permanente al problema”. "No estaríamos causando ningún impacto porque la polilla está distribuida naturalmente en Colombia. Si no fuera así yo sería el primero en decir ‘a eso no le jalo"
"a los campesinos podría enseñárseles cómo hacer la zoocría de la mariposa. En Costa Rica realizaron ensayos maravillosos con los campesinos con cultivos de mariposas para exportación y aquí podríamos hacer lo mismo con la mariposa come coca"
"Eloria Noyesi: Colombia's Potential Solution to Eradicating Illicit Coca"